In my Children's Literature class, we have three projects due. The first project involves having to read a minimum of 20 Caldecott Award Winning books and analzing the illustrations and how they emphasize the meaning of the story. For those of you who don't know what the Caldecott Award signifies (its okay I didn't), it signifies an award of the highest degree to U.S. illustrator. 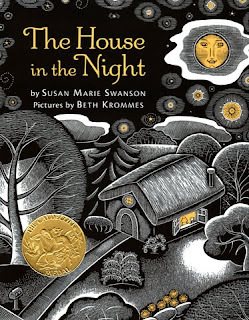 The book is essentially a younger children's book about a house with light. As you read further on, you'll see that light begins to signify love. The illustrations are absolutely beautiful. The illustrator, Beth Krommes uses only three colors: white, black and yellow. Anything yellow in the book signifies and object of light or love. I think the purpose of the book is to help a younger child, who is possibly afraid of the dark, see that even though it is dark there's still an essence of light in their room and, thus, love. So they need not be afraid of the dark when there's light and love filling their room. It's a wonderful book with very simple wording that I think every parent should have on their shelf to share with their children! I love creating lessons for older students that use interesting children's books like this one... People tend to forget that a successful picture book is not just for a small child... a great picture book is for the innocent child in all of us and can deliver just as much emotion and thought as a thick novel.